The incident took place in Los Angeles and he was 25 at the time. Jake, one of his four brothers, was 18. Smollett said his name was Jake then reportedly signed it on a promise to appear in court. He was charged with false impersonation, driving under the influence and driving without a license but later pleaded no contest to the reduced count of providing false information. Understand the ramifications of what happens if Smollett the Elder got away with this ruse. This happened to a woman in Denver. It’s bad enough when your identity is stolen. It’s worse when the person who steals it gets a DUI using your name. It happened to Stephanie Franklin, and she said her mother is to blame. “I was hurt, I felt betrayed,” Franklin said. It started last year when Franklin’s mother, Andrea Franklin, and another woman driver, Rayshandria Ewing, were pulled over by a state trooper near South Parker Road and East Florida Avenue in Arapahoe County. Ewing had no license, so she gave the trooper Stephanie’s name and birth date. Ewing was then arrested for driving under the influence of drugs and thrown into detox, all the while she claimed her name was Stephanie Franklin. Stephanie had no idea what her mother and Ewing had done until she was pulled over in a routine traffic stop and the police officer told her she had a warrant out for her arrest for a DUI and that her license had been revoked. “I kept saying I didn’t commit the crime, I am innocent, but no one would listen,” she said. What Jussie Smollett did to his younger brother had perilous implications. Having been a victim of identity theft, I know first-hand the issues involved. I was arrested and detained for hours early one morning after being pulled over for speeding. As I waited in a cold jail cell in Plano, Texas, officers came in about every 15 minutes asking about my tattoos. I explained that I had no tattoos. After the third visit, I asked where the tattoos would be so I could prove I had none. Keep in mind I’m wearing only underwear and a t-shirt, as my suit was folded not-so-neatly in a plastic bag. The officer checked my shoulder, noted no tattoos, and I was released a couple of hours later with an apology. But who knows what could have happened, as Leftists see America. Those officers could have hung me in my jail cell, right?! 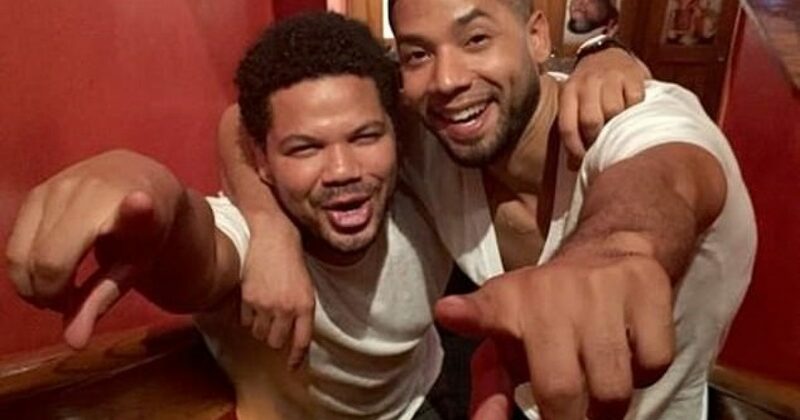 As for Smollett, he proved that he will do anything to get out of a situation. One can only try to imagine the story he’s concocting for his latest melodrama, where he accused to innocent people of a crime he staged. But what’s really interesting is how Smollett resolved his issues. According to the article, Smollett completed an alcohol education and treatment program the following year. Ok, so that explains the DUI. But what did he complete to stop stealing the identity of family members. Apparently there is no detox for the conspirator’s mind. You can bet “baby brother” is checking his credit report routinely with his big brother lurking in the shadows.